According to statistics, the number of civilian casualties has reached 40546 killed and wounded since the start of the coalition war on Yemen. The statistics indicated that 3495 children were killed and other 3497 wounded in 1400 days of aggression. During the same period, 2250 women killed, and 2524 other women were injured. The number of men who were killed during 1400 of the aggression amounted to 10113, and 18712 men were injured during the same period, according to the Statistics. 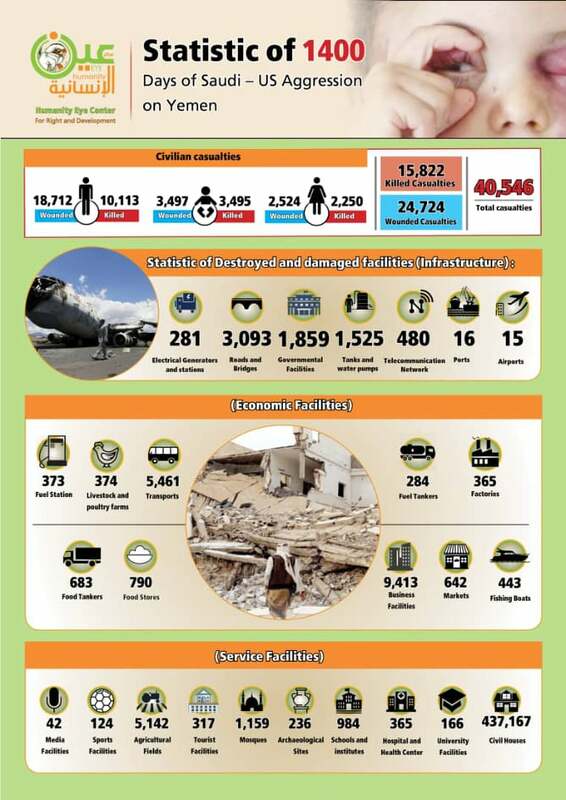 While 984 schools and educational centers were completely or partially destroyed during the same period, while the alliance destroyed 1159 mosques, in addition to the destruction of 1552 sources and water installations, 236 archaeological sites, adding 437167 houses during 1400 of the coalition countries ‘ War on Yemen.